It’s a very interesting time in supply chain. There are a number of exciting technologies coming together to create new possibilities, and dynamic new ways of doing business and meeting customer needs, technologies like blockchain and artificial intelligence. One dramatic example of what companies are doing is Overstock.com, which started as a discount furniture company, and is now heavily invested heavily in blockchain technology, and has its own cryptocurrency unit called tZERO. 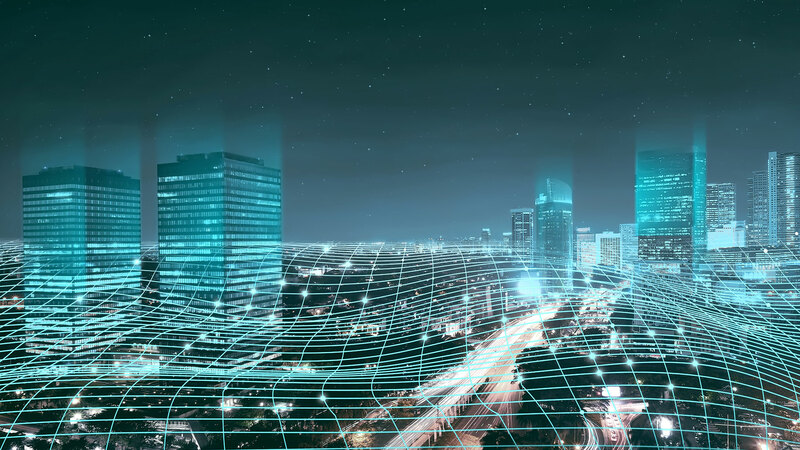 The big disrupters are the companies that leveraging multi-party networks, artificial intelligence and autonomous technology to change industries and to connect buyers and sellers, and match supply to demand in real time. Companies like AirBnB, Amazon and Uber, have boosted service to consumers while taking out costs and delays. Consumers are becoming accustomed to this new frictionless way of doing business. Supply chain as a function is becoming much more of a stakeholder within companies. We are seeing roles previously labelled as procurement moving to more of a supply chain role. Even companies in industries like oil and gas that are creating supply chain organizations. So we are seeing a major shift away from internally-focused strategy with Enterprise Resource Planning (ERP) at the center, to a much broader and more collaborative strategy using new technologies. This first trend is the moving towards a multi-enterprise or network-based solutions. This will be more apparent with processes like procure-to-pay, order-to-cash, and these types of processes are multi-party, these will move to the networks. This is a major shift away from ERP. ERP is good for HR and finance. But many companies don’t want to take on these drawn out costly projects. A streamlined, network, cloud-based deployment that is lower cost and faster results. The premise of planning around internal criteria is not viable strategy in today’s customer driven supply chain. How good would you be at your job if your cubicle had no openings? How much value would you bring to your company and your customers if you couldn’t communicate with anyone outside your cubicle? That’s very much the situation a lot of companies find themselves in with ERP solutions. Multi-party networks feature collaborative planning and execution across multiple tiers of the supply chain. Because these networks extend visibility and collaboration outside the enterprise “cubicle,” these networks are going to come to prominence. We saw credence with Gartner’s inaugural magic quadrant for Multi-Enterprise Supply Chain Business Networks. The aspiration is clearly growing, but success with networks requires a multi-party, multi-tier platform. Adaptable platform with modules and agents to fill in gaps and meet industry specific requirements. And these modules will need to fit specific industry needs. A one-size-fits-all approach won’t cut it anymore. Having this type of approach will allow companies to streamline ERP projects, focus on what ERP is good at, while moving these multi-party processes to the network to drive more value, much faster and at a much lower cost. This will also help leverage other technologies like blockchain. Blockchain is a great tool to move companies toward thinking from a network mindset, but it is early days and there are still problems with the technology, namely: the multi-party MDM, permissions, scalability. Until these problems are addressed, blockchain will remain largely conference room pilots. This permissibility and scalability issue we solve with an approach that we call a Network Orchestrated Blockchain. We think it will become a dominant technology. The network uses its mature and proven technology to do the heavy lifting in terms of managing permissions and orchestrating parties and processes, but with the ability to write to a blockchain like Ethereum or HyperLedger Fabric if you want to. I believe multi-party networks with their permissibility and scalability will play the dominant role, but they can be combined with blockchain for transparency and immutability to foster a much wider range of commercial applications and capabilities than blockchain alone. Enterprise facing systems in most cases ignore (or make guesses concerning) external constraints such as lead times. Enterprise systems work on stale data. The problem with these enterprise systems is that they tell you what your business looked like yesterday, they don’t take into account the current reality which is often very different. Decisions based on yesterday’s data miss many emerging threats and opportunities, and thus they deliver poor outcomes. These combination of this lack of considering constraints and critical inputs, and stale and fake data, leads to inaccuracy in these enterprise planning approaches over time that limits the value a company can gain and kills adoption. This is where platforms with tools with autonomous agents that make decisions based on real-time transactional input really provides a disruptive approach, similar to how Uber matches supply to demand in real time, which turned the cab industry upside down. Need to be able to segment the supply chain and apply planning and autonomous agents at multiple levels and segments of the network. This is another example of how pure technology like Machine Learning, AI, RPA, etc. isn’t delivering full value yet, because it’s based off enterprise approaches which limit their effectiveness. A shift to multi-enterprise networks will enable companies to get much more value from these technologies as they can leverage the network. There is a growing realization of the need for a full supply chain control tower. We’ve seen companies take a data warehouse and data lake approaches, but these are showing limited ability to drive significant value and can be costly and time consuming. Big data projects tend to be both backwards looking and enterprise/internally focused paradigms. As discussed with planning, decision making, AI, etc. processes need to sit on transaction layer. These can also be digital twins. These data projects are run by IT teams rather than business teams. The move to Actionable/Autonomous control towers will drive more value than pure analytics. Level 1 – visibility and alerting – WHY Monitor What you Can’t Fix. Most applications fall here, highlight issues through reporting and alters. Level 2 – adds collaboration to visibility – the ability to jointly work with trading partners on executing processes and resolving issues. Level 3 – moves to decision support that can be fed to business roles. Level 4 – introduces autonomous control – the system will be able to solve many issues much more quickly and effectively than human users. But these control towers really need to be driven and crafted by business resources, and the technical aspects need to be automated within the platform. So expect to see a shift from IT to business projects. So, for a successful control tower implementation that is consistent with existing ERP and leverages new planning approaches, companies need real time actions driven across multiple tiers of their supply chains and driven by AI. A VP of Supply Chain of an oil and gas company, recently mentioned that they are automating purchase orders and taking the buyers out of the equation. So now they need more sophisticated people who are capable of performing higher level tasks, who can translate business requirements into these new technologies. She said we’d be lucky to find two or three people who can do this in an entire organization. In a similar vein, an expert at the Supply Chain Center at University of North Texas Dallas drove this point home saying that what we really need in future are not data scientists but knowledge scientists. These new technologies require new skills, of which there’s a distinct shortage right now. This will only worsen as these technologies expand. Companies that can train employees or attract the right talent with these skills, will have a distinct advantage as we move towards these machine learning and artificial intelligence driven paradigms. A study I saw recently among millennials and their preferences, showed that that taking the dog to work was a top 5 requirement in many of the responses. Younger employees today want different things. Finding and attracting this kind of talent will require a shift on the part of companies. These trends are steadily picking up steam and will continue to accelerate as new companies come on to the scene and older companies upgrade their existing systems. Companies should anticipate these changes and plan to align their technology, processes and skills with these trends. Multi-party networks are a relatively mature and they are a proven technology that can be adopted and leveraged for benefits immediately. They enable companies to work much more closely and easily with their trading partners. The most disruptive forces, such as Uber, are the ones that use a single version of the truth, with real-time supply-demand matching, with full end-to-end orchestration through to financial settlement. This model is likely to continue to disrupt other industries, so it is imperative that companies are prepared and pre-empt such a disruption with their own transformation. The technologies that are embedded in these new models, technologies like blockchain and AI, are dependent on these new network models to extract the maximum value from data that would traditionally be siloed and inaccessible. Finding and managing talent to support this shift is going to be critical. Companies should not only begin laying the groundwork for the technology, but also identifying talent in these fields and implementing training for existing employees whose roles are likely to be impacted by it. This will make the transition much smoother and more sustainable. While artificial intelligence has the potential to dramatically improve the supply chain, as yet companies are still struggling to extract real value from the technology. 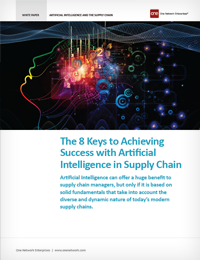 This report looks at the reasons for this, and identifies eight mistakes which hold the key to achieving success with AI in the supply chain.